"Originally published in the United States by Doubleday, a division of Random House LLC, New York, in 1949 and 1978"--Title page verso. A time-tested classic--first published more than sixty years ago--that has helped millions achieve mastery of English, now in an Anchor mass market edition for the first time. 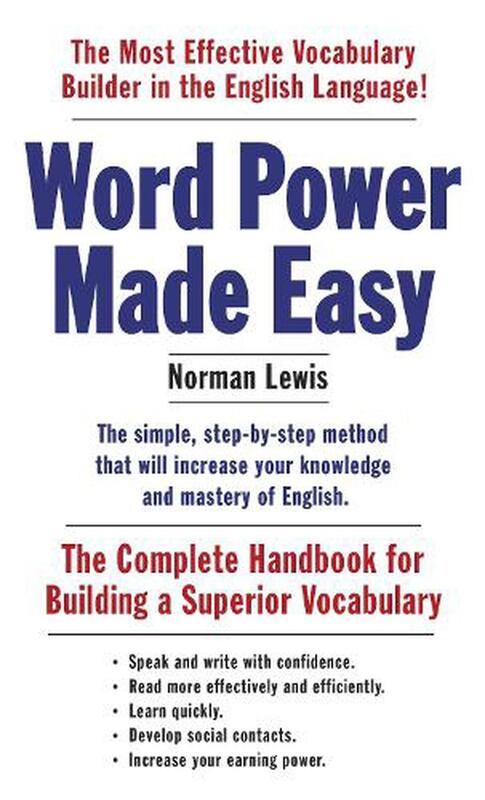 Word Power Made Easy is the most effective vocabulary builder in the English language. It provides a simple, step-by-step method for increasing knowledge and mastery of written and spoken English. Arranged in thematic sections--on everything from how to flatter friends and insult enemies to how to talk precisely about science and medicine--the book is written in a lively, accessible, and often humorous style, presenting ideas and a method of broadening your knowledge as an integral part of vocabulary-building. The author delves into etymology to arm the reader to decode unfamiliar words, provides phonetic pronunciations, gives tips on avoiding common spelling errors, and offers useful sections on which fussy, old-fashioned grammar rules are valid and which are outdated or misguided and can be safely ignored. Loaded with helpful reviews, progress checks, and quizzes to reinforce the material, this classic resource has helped millions learn to speak and write with greater sophistication.